Busan- the coastal counterpart to South Korea’s bustling capital city should not be missed. Although only a 2.5 hour train ride from Seoul, t two cities could not be more different. Busan, although being the second largest city in South Korea has a very laid back, beach town vibe that is the perfect escape from Seoul’s ever crowded streets. Originally a poor area, Gamecheon quickly became a tourist destination when students began painting the walls, and stairs with fun murals. They offer maps at the entrance of the village that will take you on a scavenger hunt loop through the colorful city. 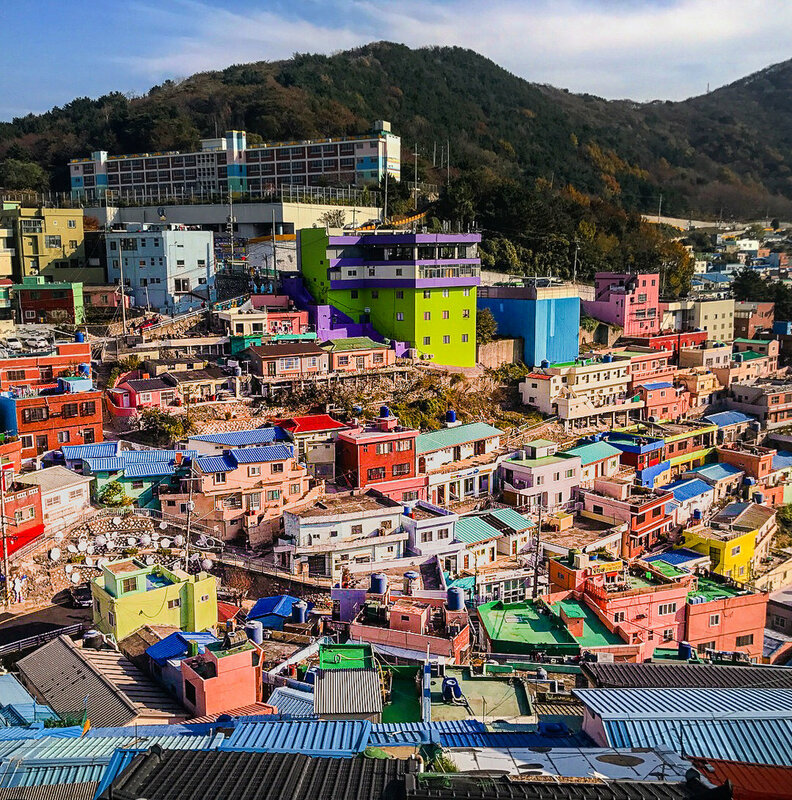 It truly felt as if we had been inserted into Mario Party or Legoland (which is saying a lot because the rest of South Korea is already so colorful). I’ve always been really interested in Asian architecture, especially the temples. Haedong Yongunsa was especially beautiful because it was right on the water with a type of nature reserve surrounding it from the other side. You could truly walk around the complex for hours visiting all of the different shrines and temples, and it’s really cool to see all of the different religious rituals and traditions. The Korean fish markets are not exactly for the faint of heart. The Jagalchi fish market has hundreds of stalls of unidentifiable fish and sea creatures. I learned that there are approximately 100 different species of these aforementioned sea creatures that I never even knew existed, much less that you could eat them. What I would warn against is not getting so enthralled in the chaos of the market that you completely forget where you are. We got SO lost ( a constant theme of my travels), and were wandering around for about an hour before finally finding our way out. .
Getting to Busan from Seoul is REALLY easy. RomeToRio is a really great resource (and my favorite site) for finding transportation between cities. There are a variety of different options depending on your budget and type of transport. We chose to take the train which gets you there in around 2.5 hours. It costs about $50 which is a little expensive, but we didn’t have a ton of time in South Korea and wanted to make sure we were making the most of it. You can book tickets online up to 30 days in advance at the Korail website here . The train leaves from Seoul station and stops at Busan station (both of which are very well connected to the respective metros in both cities.